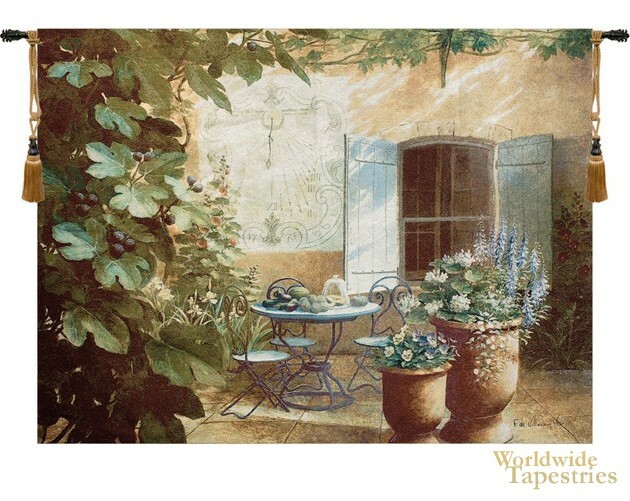 This tapestry "Afternoon in Provence" shows an idyllic scene from a courtyard in the French region of Provence. Based on the work of Fabrice de Villeneuve, this piece exudes an easy and elegant charm that is the hallmark of de Villeneuve's work. The rendition of light in this piece, as in all of his pieces, is masterful. The fall of light on window doors as echoed on the walls and rest of the scene creates a soft and breezy feel to the scene. The use of color is totally harmonious and is a reflection of his mastery of color. The blue green shadows of the doors complement the greens and blues of the plants and tables, while the peach orange walls complements the teracottas. French country life has its charms and this intimate work is a peak into this world. Full of country charm, this work reflects it subject matter beautifully. This tapestry "Afternoon in Provence" is backed with lining and has a tunnel for ease of hanging. Note: tapestry rod and tassels, where pictured, are not included.